Elda&Co.Offer Yourself This Beautiful Piece of Jewelry & Get The Irresistible Look That Every Woman Craves. Made of superior quality, 18K white gold plated over sterling silver, this delicate tree of life pendant with Sapphire September birthstones and 20" rolo chain will never let you down. Enhance your feminine look instantly; you don't have to put on excessive make up or over dress yourself to feel confident. Wearing this gorgeous pendant enhancer necklace is enough to boost your image and make your day! Impress your girlfriend, fiancée, wife, mother or friend with a unique piece of luxurious jewelry. This Circle pendant is an excellent choice for anniversaries birthday christmas mothers day or any special occasion. Gracefully packed in a beautiful jewelry box, it makes for a great present that never loses its value. 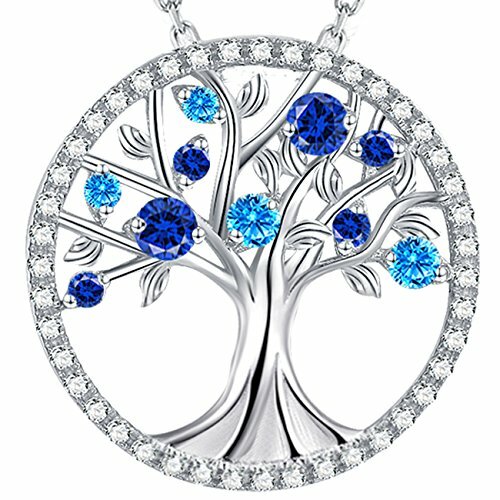 ❤️QUALITY COMES FIRST❤️ This splendid circle tree of life pendant with the best quality Created Sapphire and Created Blue Topaz you can find with AAA cubic zirconia and Sterling Silver. The supreme quality of these 18K white gold plated over sterling silver pendant and 18" + 2" necklace adjustable rolo chain will never let you down. ❤️Gift IDEA FOR WOMEN and GIRLS ❤️ Comes in nice navy blue gift box. Perfect gift for Birthday,Mothers Day, Anniversary Day and Birthday gift for wife, mom, grandma and girlfriend. Treat yourself or some special to this stunning necklace. ❤️STAND OUT IN STYLE❤️The exquisite silver color and the unique design of this necklace make it an elegant addition to the jewelry collection of any woman, who wants to stand out with her own, unique, luxurious style! If you have any questions about this product by Elda&Co, contact us by completing and submitting the form below. If you are looking for a specif part number, please include it with your message.